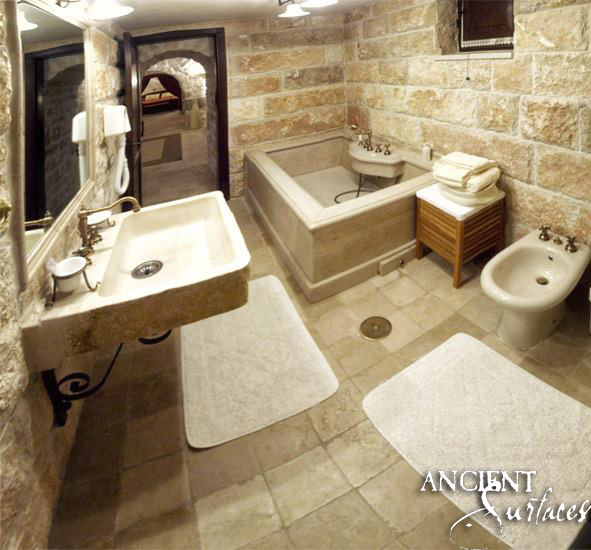 bathroom stone flooring | Old Stone Sinks by Ancient Surfaces. 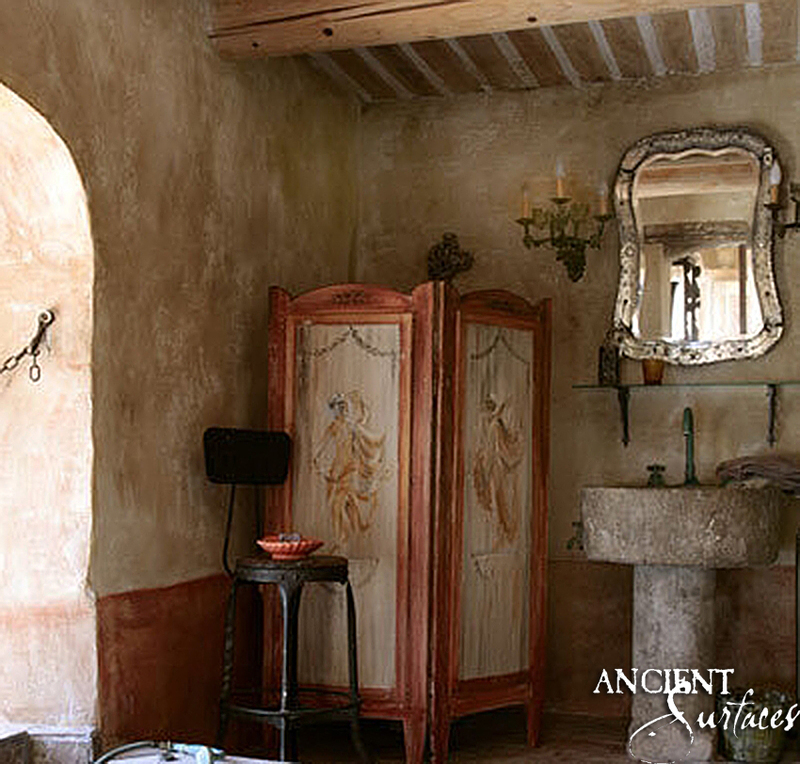 The vintage farmhouse bathroom décor expresses the nostalgia of today’s world for the classical frugality of Mediterranean design as experienced for generations across pass centuries. Nowadays, we often thirst for the days when people were able to distinguish black from white, when technology was a thing of fiction, we yearn for natural inspirations, we dream of simpler times when family was everything, when beauty was of nature, when people just stepped out of their front doors into your own vegetable gardens for organic food, water was drinkable, air breathable and the milk was always a few yards away. 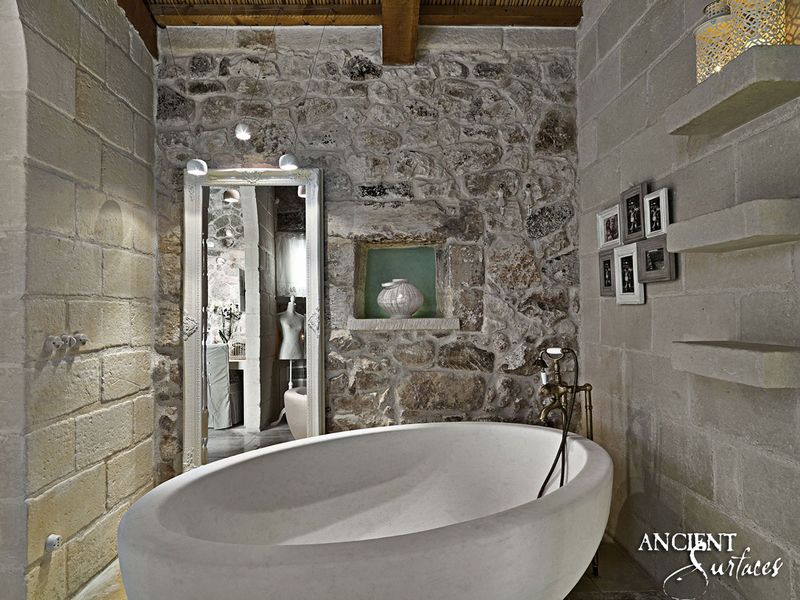 If you want to recreate that human charm that existed in the dwellings of the past century while incorporating the best of what our advanced technologies have to offer, you can give your bathroom an authentic Mediterranean farmhouse touch by infusing it with old reclaimed stone elements that were used by our ancestors once upon a time. 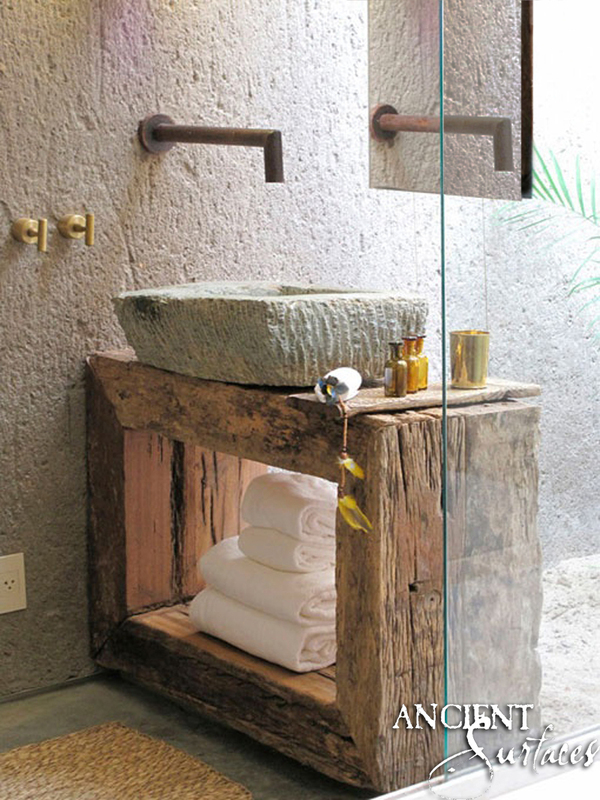 Most bathrooms are relatively neglected in terms of authentic design. 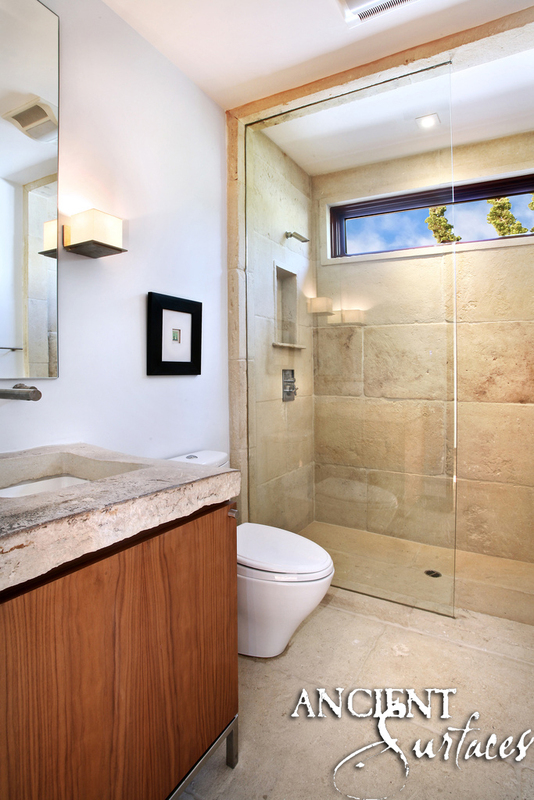 Even when we think of special or customized features in our bathrooms we tend to be stuck on the technical features that gives you the best performing this or that without paying much attention to the finer tailored human details. Modern bathroom have become much like us. They mimick our lifestyle our pace, they resemble our day to day interactions and relationships. They are highly synthetic, glossy or with a brushed, washed or honed finish, giving us the illusion of wisdom through time and the impression of authenticity and tradition. We have grown to accept this insincerity this forgery of the real thing as long as it costed us a bit less of time, money and labor investments. What did we get as a return on our underinvestment? 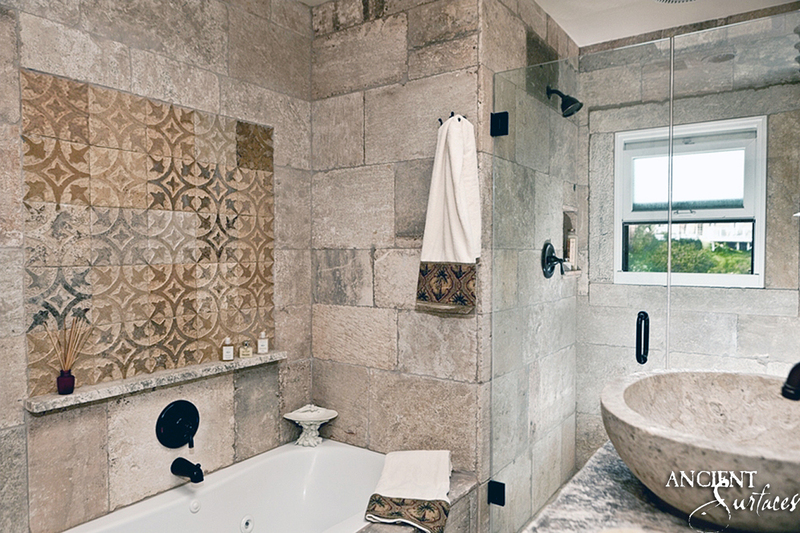 Well, we’ve gotten back a ‘faux’ sense of comfort and an ephemeral design showmanship that has failed to inspire us past the surface, a veil of make-believe that will leave us wanting for the true stone bathroom elements that would normally leave us in awe every time we laid eyes on them. 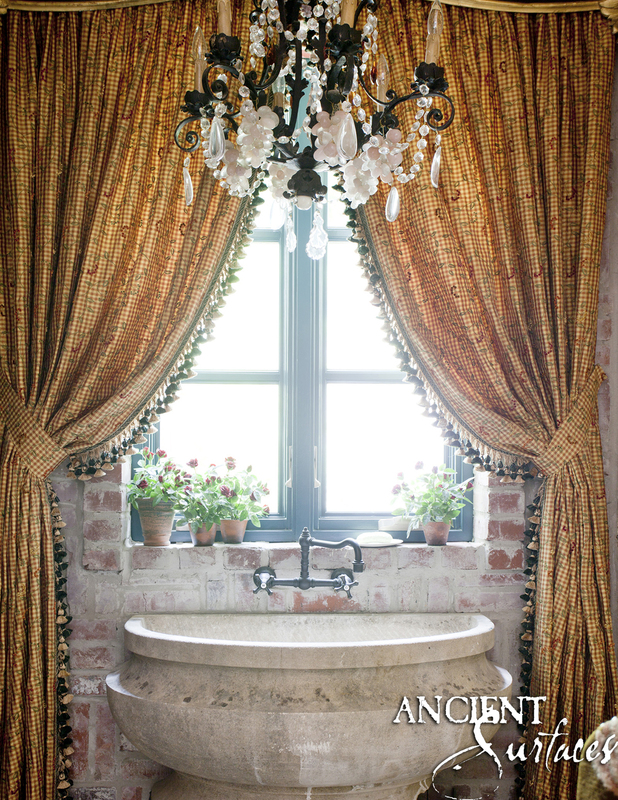 Architectural antique elements are the true antidote to the conveyor belt, cookie cutter machine-made mindset that has poisoned the inner-sanctum of our home design. 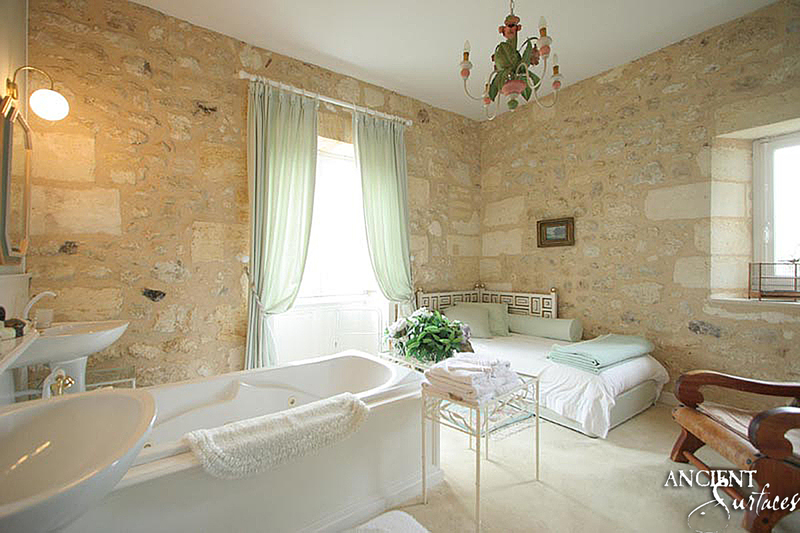 Ancient limestone are a gateway to relaxation to meditative escapism. 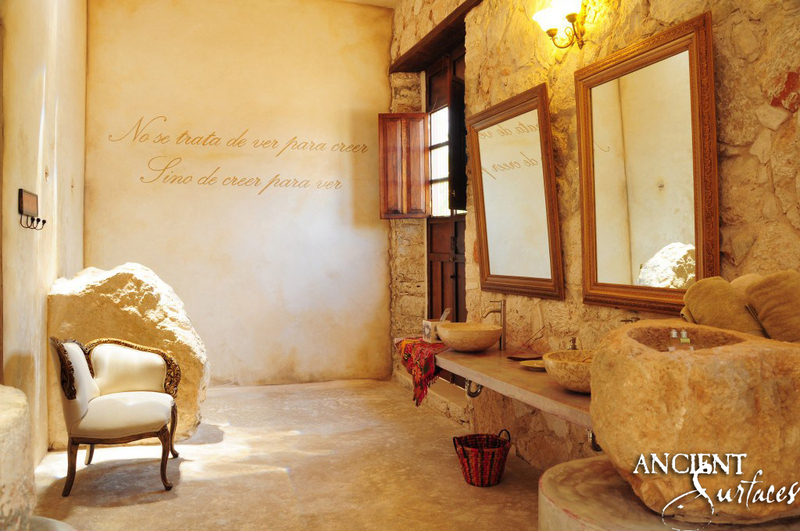 A well thought of and well-designed authentic farmhouse bathroom will transform your outlook, it will give you a precious moment for yourself to unplug from the synthetic controls of modernity, allowing you a brief moment of reflection and of self-observation. Those are very important concepts that we seem to be slowly losing in our lives. 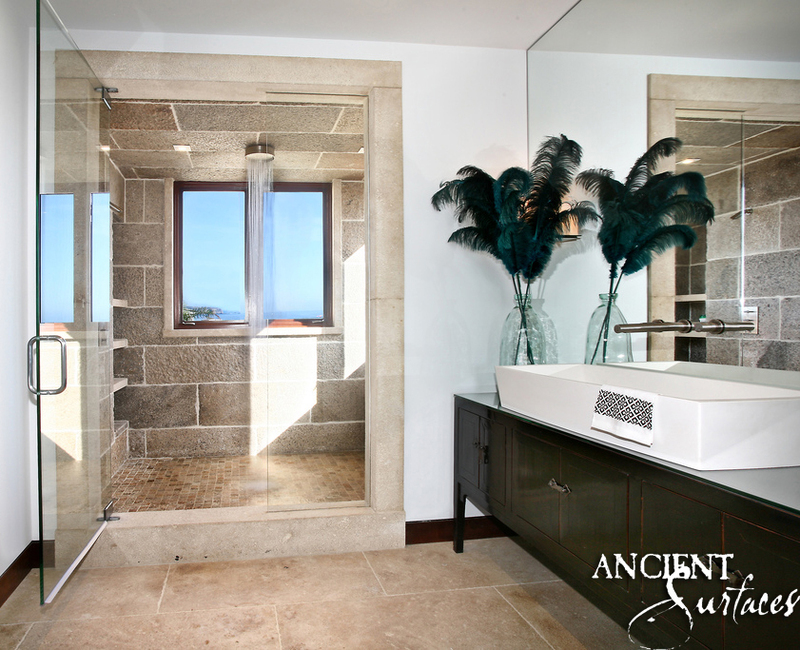 Old world stone elements that have stood the test of time go beyond the decorative and become devices of immense therapeutic values, serving to remind us of our roots and connecting us to our common and basic humanity. 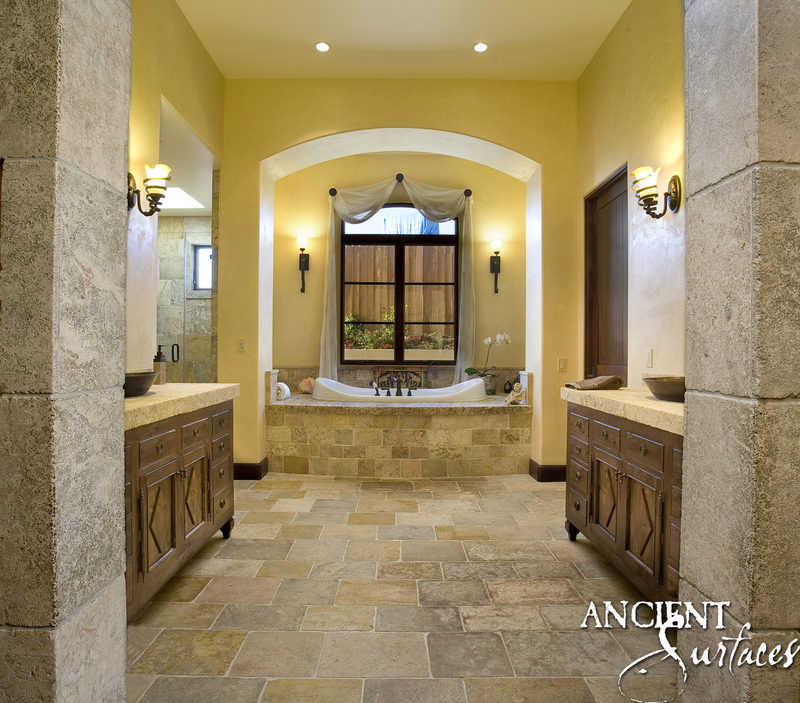 Let this blog inspire you to move towards natural historic designs. 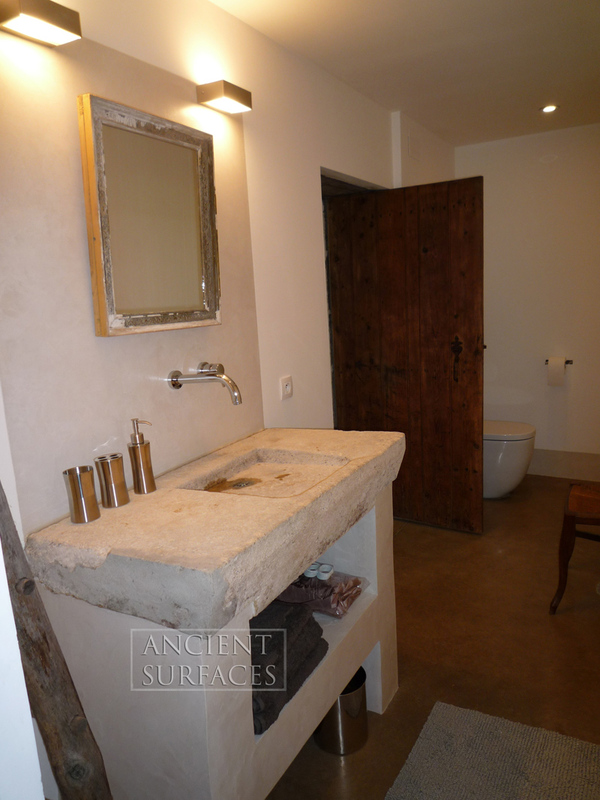 You will soon find out that taking the lesser traveled road of antique limestone floors, of centuries old carved sinks, and of ancient thick limestone slabs will lead you toward design bliss. We know that what we offer you will have a positive impact on your life and your family’s life at more than one level.We also like to encourage you to using antique furnishing pieces as powerful focal point if possible. An antique dresser in the corner perhaps, or using a detached toilet tank model as in ancient times when the tank was often mounted high on the wall above the toilet. Old world lighting is crucial in completing any authentic farmhouse bathroom. 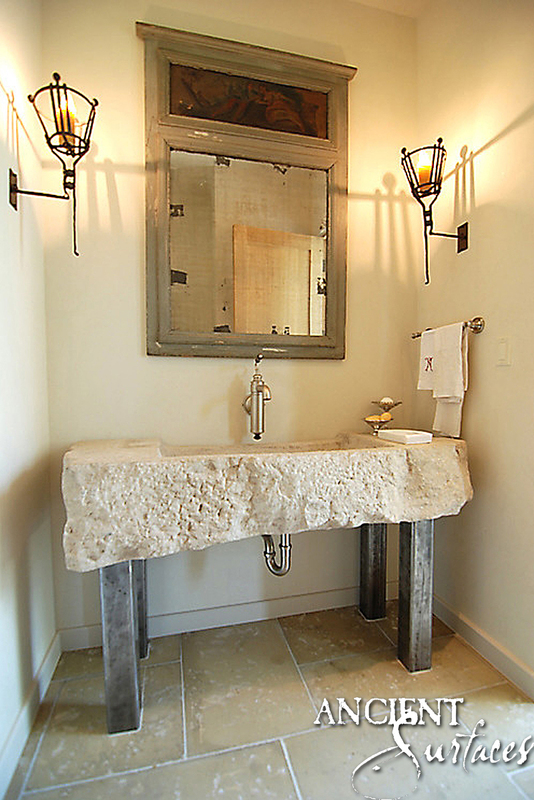 A farmhouse bathroom is always luminous but can be dimmed on demand. So if you have big windows, you should only cover them partially, or use transparent curtains but should consider installing real shutters that can be closed at an instant. 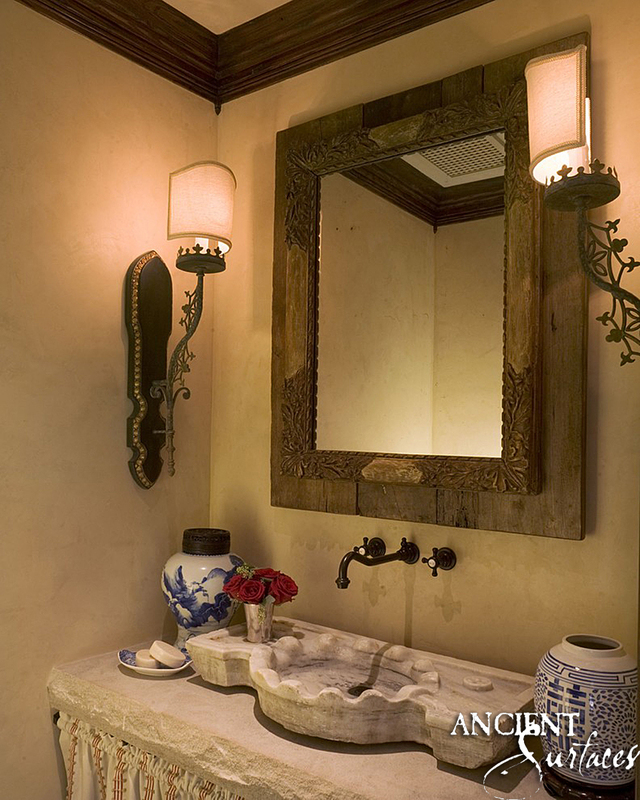 Deep trough sinks and antique stone flooring will pay witness to a bathroom’s century-past humble beginnings. 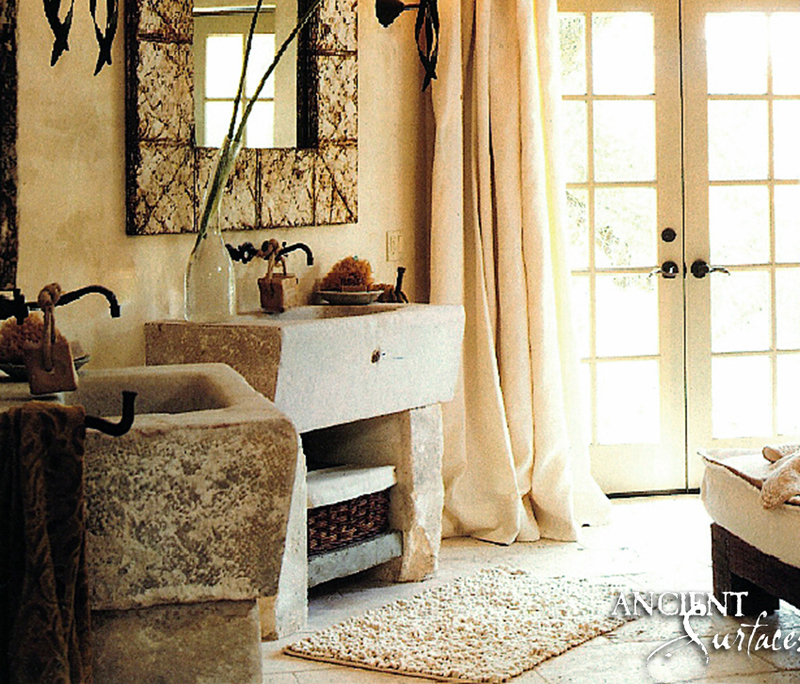 A country stool and an antique area-rug can also enhance your bathroom’s assembled-over-time look. 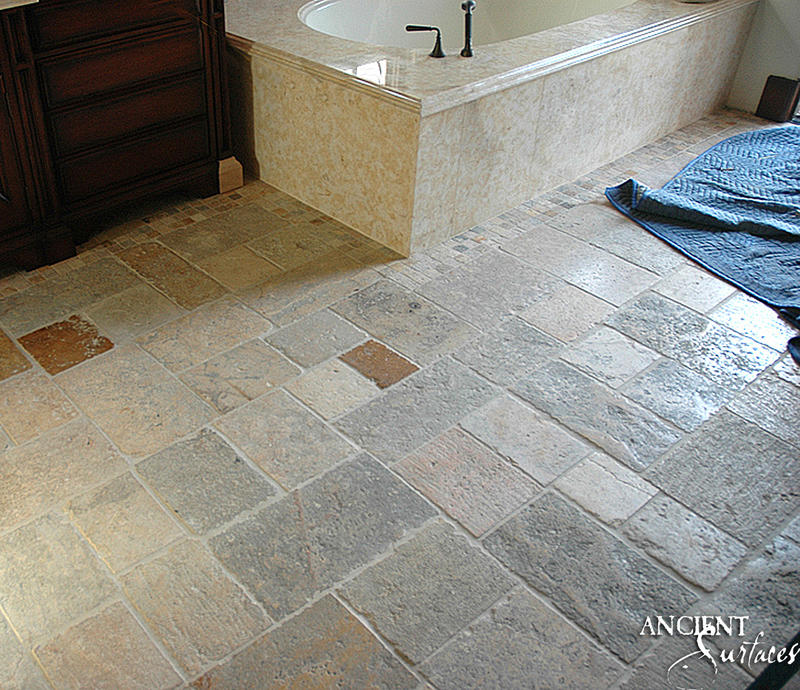 We are barely keeping up with the increased demand for our antique limestone and marble floor that has originated from centuries ago. 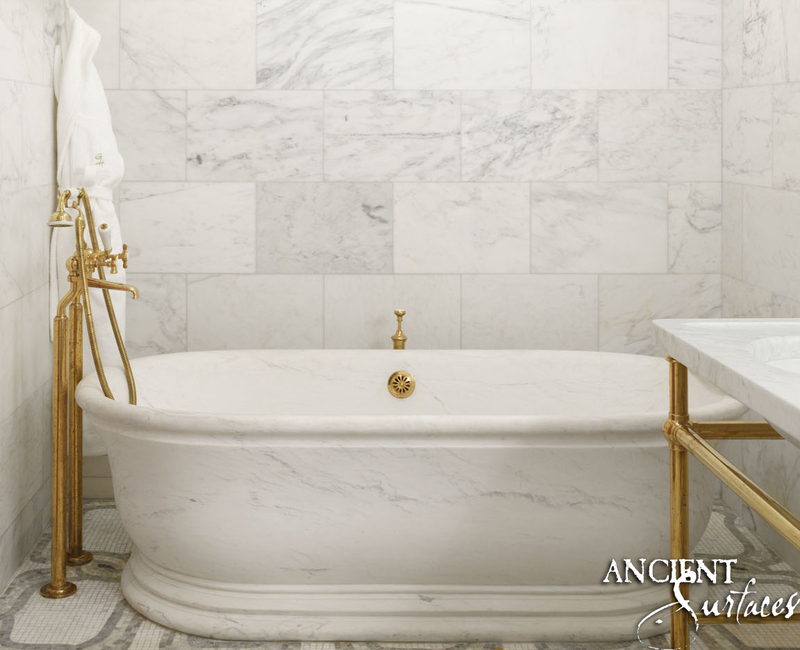 The historic value and esthetic charm embodied in the antique limestone and marble floors are unrivaled in warmth and elegance and are unsurpassed by any other reclaimed stone flooring collection. 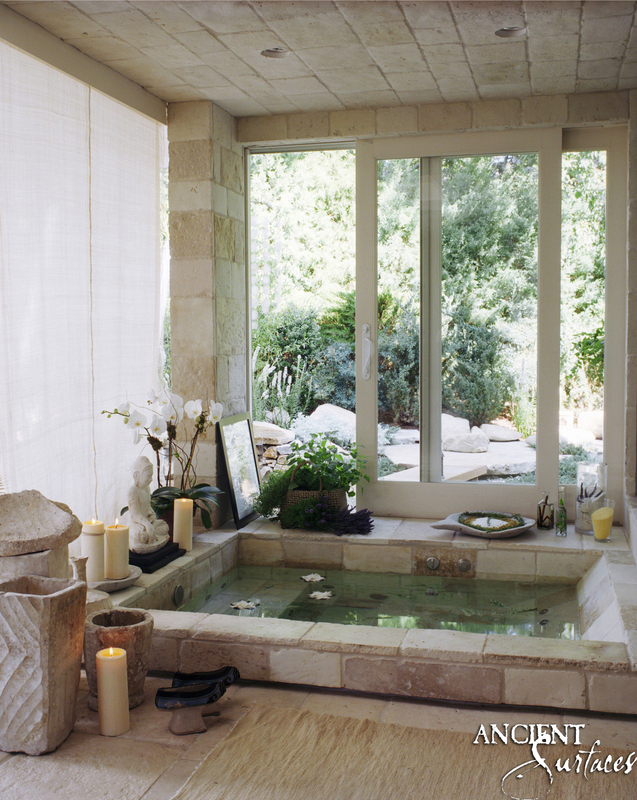 Let’s not forget our unique stone tubs will help mesh with your farmhouse layout. 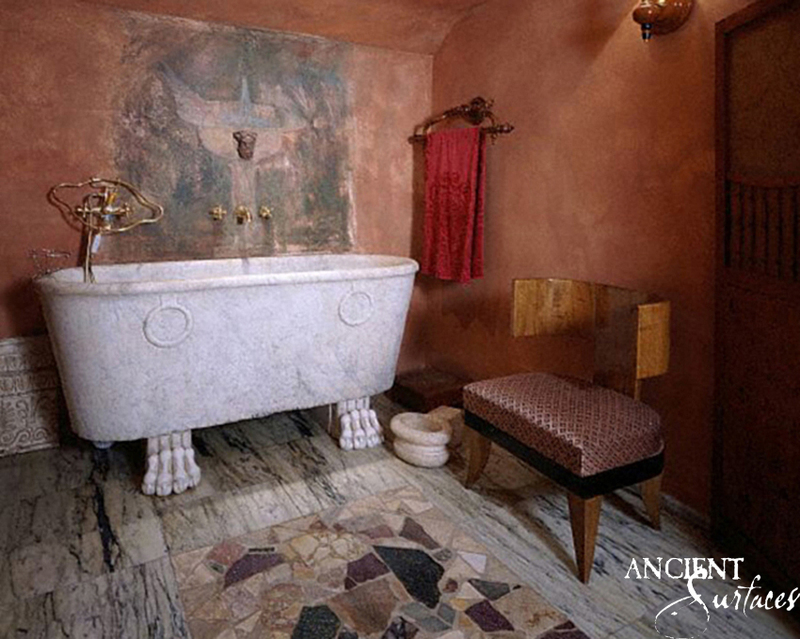 Unwinding in one of our hand carved limestone tub will transform your farmhouse bathroom into a southern French hydrothermal escape. Dimed lighting from an antique pendant chandelier coupled with a soft meditative rhythm is all you need when you’re laying inside your warm master bathroom tubs. 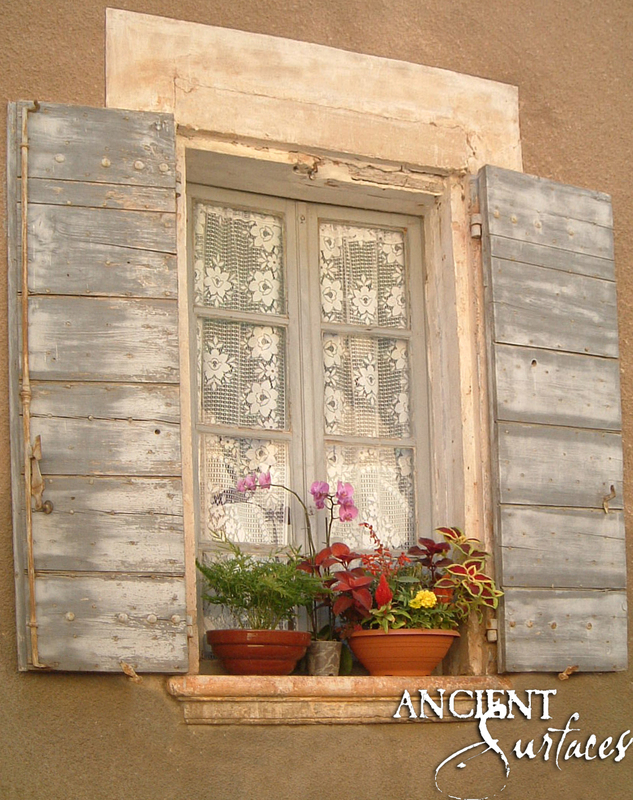 We at Ancient Surfaces, live by this design philosophy that we preach. 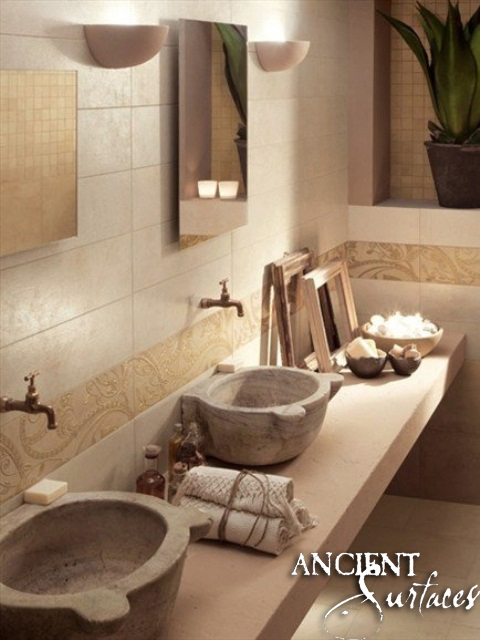 We have no doubt that once you amerce yourselves with our utilitarian antique limestone elements, your design will therapeutically affect your lifestyle your state of mine and even your health.